Easy and reliable whirlpool/spa operation. Our Easy Touch is available with up to four functions. Each function has an LED lamp indicating when the function is activated. 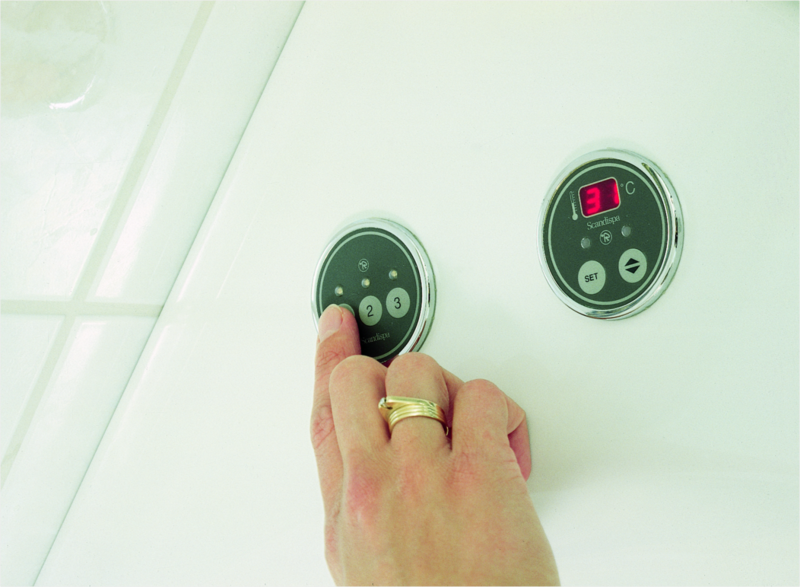 Our Easy Touch is also fitted with a "Power On" indicator and a level indicator which show whether the unit is powered up and if there is sufficient water in the pool. Control unit for whirlpools and spas with a "Power On" indicator and level indicator. Our thermostat is specially designed to fit into the rim of the spa or whirlpool. It has an easy-to-read display, showing current water temperature/programmed temperature. Two buttons are all you need to set the water temperature, Easy as ABC. Control unit to adjust water temperature in whirlpools and spas. Works with all Scandi control panels with heating.